A complex number can be represented graphically as rectangular coordinates, with the x -coordinate as the real part and the y -coordinate as the imaginary part. The modulus of a complex number is the square of its distance to the origin. The Pythagorean theorem tells us that this distance is . 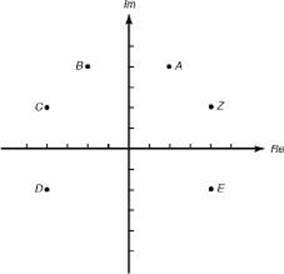 The conjugate of the imaginary number a + bi is a – bi , so the graphs of conjugates are reflections about the y -axis. Also, the product of an imaginary number and its conjugate is the square of the modulus because (a + bi )(a – bi ) = a 2 – b 2i 2 = a 2 + b2. 1. If z is the complex number shown in the figure, which of the following points could be iz? 2. Which of the following is the modulus of 2 + i?